see solution video for the derivation. This is College Physics Answers with Shaun Dychko. We're going to show that the Hall Effect voltage in two different cases where everything is the same except for the diameter of the wire is going to be inversely proportional to that diameter. So the Hall Effect is going to be the magnetic field strength times the diameter of the wire times the speed of the charge carriers through it. So this is the drift velocity of the electrons in other words. And from a different chapter, we know that the current equals the density of the charge carriers multiplied by the charge per charge carrier times the cross-sectional area of the wire times drift velocity and we can solve for vd after we make a substitution for area and say that it's Pi times the diameter of the wire squared divided four. And normally I would say Pi r squared is the diameter of a circle but we can substitute in d over two in place of r and this makes Pi d squared over four. That's we got substituted for A here. 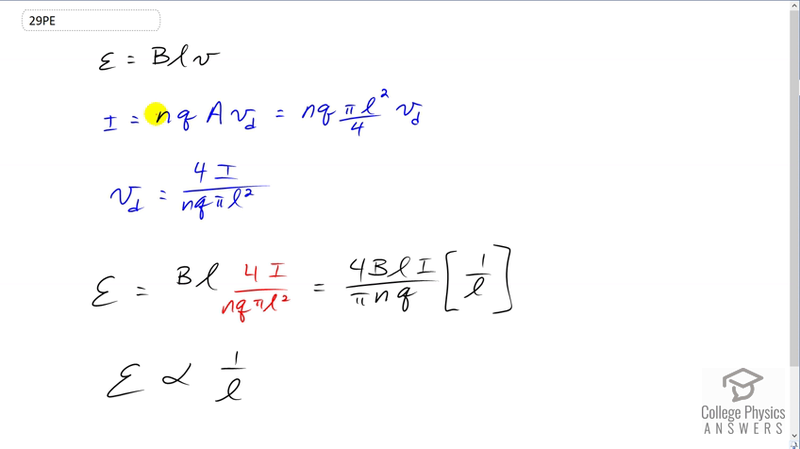 And then we'll solve this for vd and so vd in drift velocity for electrons is four I over nq Pi l squared. l being the diameter of the wire. So that we can substitute all of this in place of v. And so the EMF is Bl four I over nq Pi l squared. Well this l here cancels with one of the ls there. And so we're left with all of these factors times one over l. And so this means the EMF is inversely proportional to the diameter of the wire because inversely proportional means, you can write as some stuff multiplied by one over the thing that you are inversely proportional to. So, in d that's what happened here. And so we can say EMF is proportional to the reciprocal of the diameter, in other way of saying it, but more commonly you say, it's inversely proportional to the diameter.